The wired Ethernet ports on virtually every laptop (and desktop for that matter) have been stuck at a maximum speed of 1GbE (1Gbs) for decades. That 1Gbs cap was thought to be the speed limit for traditional copper Cat 5e and Cat 6 cabling, but Aquantia figured out how to exceed that limit with a number of its network controllers, and has been selling multi-gigabit products into the enterprise and consumer space for a few years now. I recently wrote about the company’s IPO and have some more of its history available here for those of you that may be interested. In addition to making moves in the autonomous vehicle space, Aquantia recently announced that it has collaborated with Akitio – makers of specialized external storage solutions – on a docking station that features 10GbE networking, among many other things. 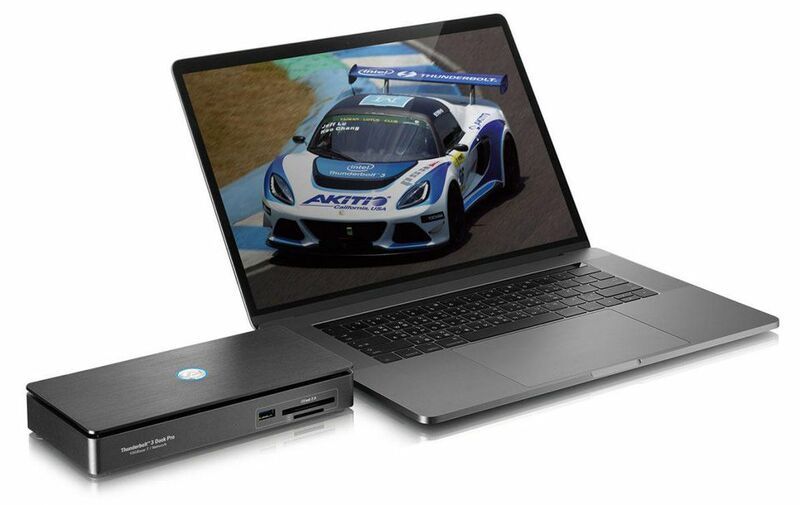 As its name implies, the Akitio Thunder3 Dock Pro with 10GbE connects to laptops and notebooks via Thunderbolt 3.0. A single cables runs from the dock to a system and brings that aforementioned 10GbE networking capabilities, along with fast SD and compact flash card readers and a USB 3.1 port on the front of the unit, and two USB 3.1 ports, a DisplayPort (which can power a 4K display), an eSATA port, and dual Thunderbolt 3 ports (for daisy-chaining additional devices) on the back. The Akitio Thunder3 Dock Pro can also provide up to 60 watts of power for recharging attached devices and it has an adjustable fan for noiseless operation too. The Akitio Thunder3 Dock Pro is built around the Aquantia AQtion AQC107 Ethernet controller, which supports 2.5GbE, 5GbE, and 10GbE networks, but is also backwards compatible with legacy 10/100/1000BASE-T networks. The Thunder3 Dock Pro works with both Apple macOS and Windows and appears to already be available on-line for about $350 USD. huh nice.. thank u for the info & tip..